This is going to be one of those historic weekends that people will be talking about and referring to for years to come, as filmmaker Gary (Seabiscuit) Ross’ adaptation of Suzanne Collins’ The Hunger Games (Lionsgate), starring Jennifer Lawrence, Josh Hutcherson, Liam Hemsworth, Woody Harrelson, Lenny Kravitz, Elizabeth Banks and Donald Sutherland, exceeded all expectations with an estimated three-day opening weekend of $155 million in 4,137 theaters, an average of nearly $37.5 thousand per site. While the Thursday midnight take of $19.7 million may have been lower than the last few “Twilight” movies–midnight screenings only took place in 2,565 theaters–it made up for it on Friday, expanding into over 4,000 theaters and bringing its first 24-hour total to $68 million, followed by an estimated $51 million on Saturday and a projected $36 million for Sunday. The number of records it set or surpassed with that $155 million opening are vastly impressive, not only being the highest March opening and biggest opening for a non-sequel (besting Tim Burton’s Alice in Wonderland in both cases), but in just two days, it became Lionsgate’s highest grossing release ever. Going by that estimate, it’s the third-biggest opening domestically for a movie behind last year’s Harry Potter and the Deathly Hallows – Part 2 and Christopher Nolan’s The Dark Knight, as well as the third-highest per-theater average for a wide release behind “Deathly Hallows” and the Hannah Montana/Miley Cyrus 3D movie. As far as the film’s IMAX release onto 268 IMAX screens (only one per theater), The Hunger Games brought in $10.6 million or $40 thousand per screen, also the best showing for a non-sequel, a 2D movie and a digital-only release for the IMAX Corporation. Internationally, The Hunger Games brought in another $59.2 million as it opened in 7,700 further theaters in 67 other markets where it ended up number 1 in nearly every country. Australia brought in $9.7 million, which is comparable to blockbusters like “Transformers” and “Harry Potter,” Russia grossed $6.5 million, followed by Germany, France, Mexico and Scandinavian markets, which brought in roughly $3.7 million each. 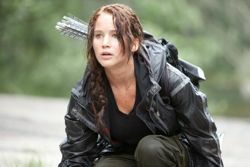 This means that The Hunger Games brought in $214 million globally in just three days. Needless to say, this has certainly been a good week for Lionsgate, who has been needing a big hit for some time, and one expects that the A CinemaScore the movie received will keep things going as word-of-mouth helps get others interested in seeing it. As hard as it may be to believe, there were other movies in theaters this weekend, such as Sony’s action-comedy 21 Jump Street pairing Jonah Hill and Channing Tatum, which dropped to second place with an estimated $21.3 million, down 41% from its opening weekend. It has grossed $71 million in ten days domestically and another $16 million internationally. Universal Pictures’ animated Dr. Seuss’ The Lorax took third place with $13.1 million, also down roughly 42%, bringing its total to $177.3 million after four weeks in theaters. Disney’s John Carter continued to drop, down a whopping 63% this weekend, to take fourth place with $5 million and $62.3 million after three weeks in theaters. The Bandito Brothers’ military action flick Act of Valor (Relativity Media) remained in fifth place with $2.1 million – possibly one of the lowest weekend takes for a movie in the Top 5 in recent memory. It has grossed $65.9 million to date. The R-rated comedy Project X (Warner Bros.) and Eddie Murphy’s comedy A Thousand Words (Paramount) each brought in just under $2 million for sixth and seventh, respectively. Project X has grossed $51.7 million to date, while A Thousand Words hasn’t even made $15 million yet. Another surprise entry into the top 10 was the faith-based October Baby (Samuel Golwyn Films), directed by Jon and Andrew Erwin and starring Rachel Hendrix, which opened in 390 theaters and grossed $1.7 million, which was enough to break into the Top 10 in the eighth position. Ninth and tenth place went to the Denzel Washington-Ryan Reynolds action-thriller Safe House (Universal) and Journey 2: The Mysterious Island (New Line/WB), each with just under $1.3 million over the weekend. It wasn’t too difficult for the Top 10 to be up from last year when The Hunger Games made more than last year’s Top 10 altogether, accounting for 75% of the roughly $205 million grossed by the Top 10 this weekend. Opening in limited release was Gareth Evans’ Indonesian action flick The Raid: Redemption (Sony Pictures Classics), which brought in $220,000 in 14 venues for an average of roughly $15k per site. No word on the expansion plans but here’s hoping it will be another hit for Sony Pictures Classics and Americans will give this acclaimed foreign film a chance.